The Sunrunner 4 is the four wheeled version of the Sunrunner 3 but having four 8" pneumatic tyred wheels this scooter is more stable than the 3 wheeled version. This very versatile scooter with attractive and streamlined lines is typical of the up to date designs to come from Shoprider the worlds number one scooter manufacturer. It is supplied with a shopping basket, anti tipping wheels and a comfortable seat flip up arms to enable users to exit the scooter with ease. With a range of appoximately 19 miles between charges, journeys to town or exploring the surrounding areas are accomplished with ease. 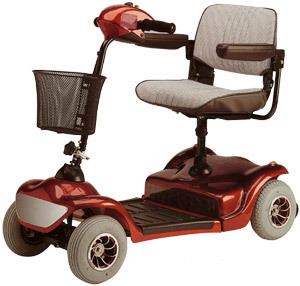 The Sunrunner 4 is the result of many hours of painstaking research and truly is a scooter for the 21st century offering the best value for money, top quality and modern design. As with other Shoprider scooters, the tiller folds flat and the scooter is easily dismantled for storage and transportation.